It’s not that I’m a “neat freak” exactly— I just prefer my environment (home, office, car, the world) to be orderly. Does this make me neurotic? Maybe, but my brain just functions better when the space around me is organized. Even as a kid, I made my bed every morning without being asked. I’m not talking hospital corners, but at the very least, the comforter was pulled smooth. Apart from some Barbies lying around or a few sweaters draped over my desk chair, my room was always well appointed. My brother was pretty tidy too. * And today, all grown up, his workshop is super organized—there is a place for everything. Labeled even. And don’t even get me started about his highly efficient laundry system. It’s a thing of beauty. We’re both giant weirdos, aren’t we? No response needed, thank you. I really have no idea what our mom did to make us this way. She never nagged (not about tidying anyway… Hi mom!). We just knew that keeping our rooms neat was our responsibility, so we did it willingly and peacefully. So now that I have two children, I expect the same from them. Unreasonable? There are many who say, yes. At the fear of confirming control issues, as long as our son lives under our roof, I expect him to respect the rules of our home. I don’t think there is anything wrong with teaching a child organization skills and the value of taking care of his belongings. My husband and I have told him from early on that his room is his space, and as such, he is responsible for keeping it tidy—this includes making his bed, picking up his toys, dusting, vacuuming, bringing his laundry down to be washed, and putting away his clean clothes. This isn’t much to ask considering how much parental units do around the house every day. Due to limitations resulting from her developmental delays, I did a lot for her in the early days. My son understands and accepts why. However, I felt guilty about it. So if I was putting away her clothes, I started putting my son’s too. And sorting his socks. And arranging the shirts in his closet by colour and sleeve length. And…. I’ve really screwed things up. Taking over and doing everything for both of my kids is doing them a disservice. Avery is nearly nine and she doesn’t need me to put away her clothes anymore. She can do a lot of it by herself. Instead, she steps out of her pajamas and leaves them lying on her floor. Not because she’s lazy, but because she’s been taught that mummy will pick them up. Her once tidy big bro has been slacking too. 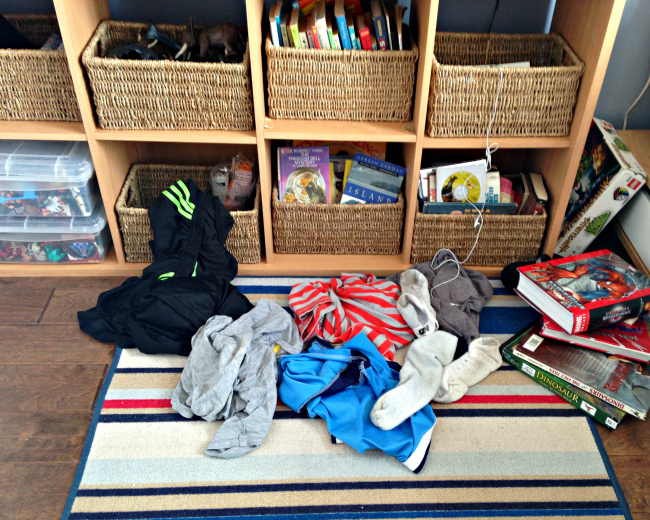 Empty drinking glasses, snack wrappers, dirty socks, Lego bricks, crumpled bits of paper…are just some of the items strewn around his room, waiting for the maid to happen along to pick them up. Mummy maid made this mess and now it’s time to clean it up. along to clean it up. 2. My parents don’t trust me to do a good job. And things must always be perfect. 3. Being organized is an overwhelming task. It’s better let an adult do it. 4. Taking pride in your personal space and living environment isn’t important. 5. My parents have spelled out my responsibilities, but it’s all talk. If I leave a mess long enough, my mum will cave and clean it up. 6. Never throw anything away. Having “stuff” matters, so keep it all—even if you don’t have room for it. On that last note, what kind of message are we sending our kids whose rooms are busting at the seams with material items? If they have too much stuff to keep organized, they probably have too much stuff. Simple as that. Perhaps it’s time to pare it down? Passing along books and toys and clothes that are no longer used, to a family in need, is an important lesson to teach our children. My daughter won’t always have me around to do things for her. She needs to learn how to care for herself and for her space. She gets overwhelmed by piles of laundry, sorting socks is difficult and hanging up clothes is a challenge. So obviously I will continue to help, when she needs it, but I need to let her try. And if her pajama drawer looks like this? It’s okay. Her PJs needn’t be neatly folded and arranged by tops/bottoms & long sleeve/short sleeves. That’s the way I would do it. This is the way she is able to do it and it’s perfect because… she’s learning to do it on her own. 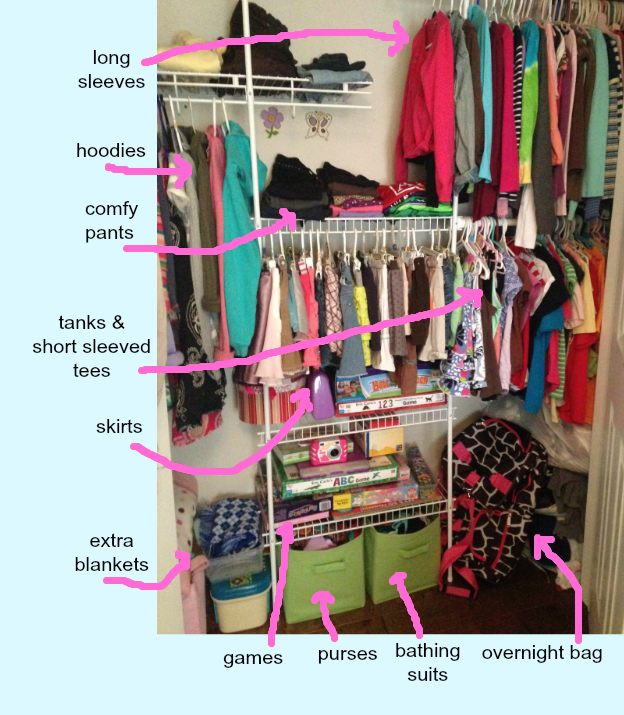 To make her bedroom housekeeping easier, we’ve arranged Avery’s closet in such a way that she can access her things easily and she knows where everything goes at a glance. If it’s safe, provide a stepping stool to reach higher items (we had to take the stool away for now since she keeps falling off it. Oye). PJs, underwear, socks and shorts are kept in a dresser. There are lots of children who for many reasons—physically and/or mentally—legitimately struggle with keeping their rooms straight and they need help. My son however, is not one of these children. He CAN sort socks and hang clothes, toss garbage into his waste paper basket, and put stacks of books back onto his bookshelf. He just chooses not to. My enabling has done this. Now, it’s time to undo it. So grab a garbage bag kiddos, it’s time to have at it! I’ll be downstairs making myself a sandwich. Do you expect your children to keep their rooms tidy? Or do you subscribe to the “It’s their space, so who cares?” line of thinking? Any tips for making it easier for kiddos to better manage their bedrooms? * So my brother was actually a bit of a slob. My memories are clearly tainted. I talked to my mum today and she said my brother’s room was a disaster. SHE cleaned up after him all the time. So, um, er….